Representative politics is in crisis. Trust in politicians is at an all-time low. Fewer people are voting or joining political parties, and our interest in parliamentary politics is declining fast. Even oppositional and radical parties that should be benefitting from public disenchantment with politics are suffering. But different forms of political activity are emerging to replace representative politics: instant politics, direct action, insurgent politics. We are leaving behind traditional representation, and moving towards a politics without representatives. In this provocative new book, Simon Tormey explores the changes that are underway, drawing on a rich range of examples from the Arab Spring to the Indignados uprising in Spain, street protests in Brazil and Turkey to the emergence of new initiatives such as Anonymous and Occupy. Tormey argues that the easy assumptions that informed our thinking about the nature and role of parties, and ‘party based democracy’ have to be rethought. We are entering a period of fast politics, evanescent politics, a politics of the street, of the squares, of micro-parties, pop-up parties, and demonstrations. This may well be the end of representative politics as we know it, but an exciting new era of political engagement is just beginning. Simon Tormey is a political theorist based in the School of Social and Political Sciences. Prior to his appointment at Sydney in 2009 he was Professor and Head of the School of Politics and International Relations and founding Director of the Centre for the Study of Social and Global Justice (CSSGJ) at the University of Nottingham UK. Spirited and clearly written, Tormey's searching interrogation of political representation as we've come to know it is sharp, provocative and compelling. Drawing widely on history, theory and contemporary developments, it will bring a new vibrancy to current debates on democracy's potential futures. "Timely, provocative and rigorous too. 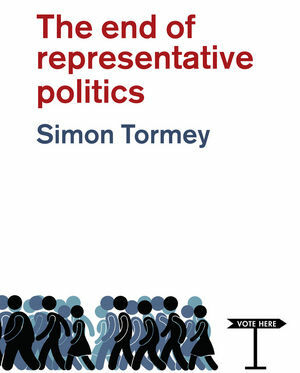 Tormey has produced an important resource for all who share the hunch that far from politics being dead, a new kind of politics is being born and with it a more pervasive democracy for which we all have responsibility." Hilary Wainwright, author of Reclaim the State: Experiments in Popular Democracy, and a founding editor of Red Pepper. "The book is informative and clearly written and provides fresh insights on the transformation of representative politics. It gives a new approach to our understanding of contemporary politics."